Sales Order is a document originated by the seller listing the goods or services ordered by a customer and other information such as prices and delivery dates. Click on the 'Select Customer' to add a customer. If it is a cash transaction, you can click on 'Reset to CASH' without having to create an account for the customer. You can add a contact to existing customer account by clicking on 'Add Contact'. Enter the Transaction Date and click on 'Submit'. Enter the Remarks and click on 'Submit'. Remarks can be any additional information that the user might want to take note of. Click on 'ITEM (SEARCH)' or 'PACKAGE' to add items, the items that have been added will appear on the item list. Click to learn on how to add item or add package. To view the gross profit, scroll the mouse to the 'Gross Profit' button, there will be a box appear showing the amount. From the example below, we can see that the gross profit is RM30. The item list price is RM130, so we are able to know that the cost price is RM100. Now you can either choose to 'Create Sales Order' or 'Create SO & Invoice'. 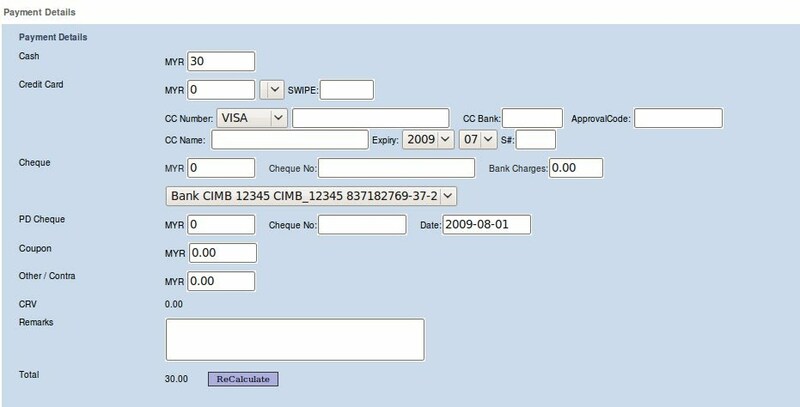 If the customer had already made a payment, you can only click on 'Create Sales Order', you cannot click on 'Create SO & Invoice'. This is because an Invoice cannot be issued to a customer who had already settled the payment. After an Invoice is created, the Invoice can be settled through the Customer > Tasks > Settle Documents / Deposit. To change the details of item, click on 'Edit' under the Action field. To remove the item from the list, click on 'Delete'. Click on 'Delivery Details' to enter the Sender and Receiver details. The Delivery Messages can be the messages that is printed on a card attached to the item to be delivered. The drop down list for Header, Footer and Message for Delivery Messages can be configure in the Distribution > Maintenance > Drop Down List. Click on 'Save Delivery Details'. If the customer had made a payment, enter the payment details. Remember to click on the 'ReCalculate' to calculate the total amount. If the customer had already made a payment, only a Sales Order is able to be created, you cannot create an Invoice.